Our last post gave us a glimpse into the life of a mom responding to the shocking diagnosis of cancer in her three-year-old son, Jack. 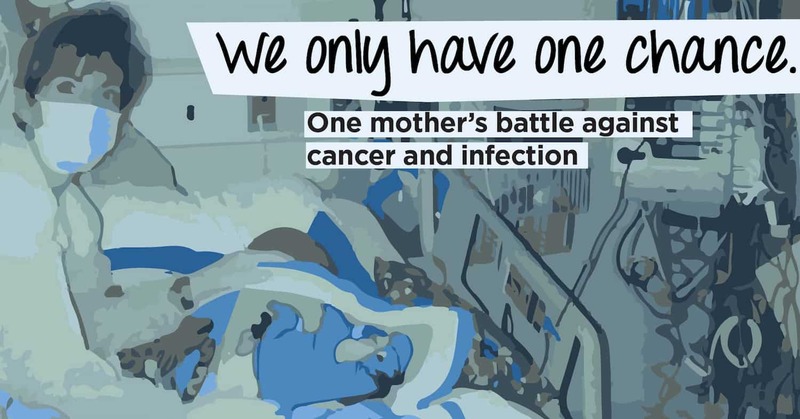 This concluding segment will explore the result of her unrelenting fight against infection as she did everything possible to help her son survive, and the lasting impact that experience has had on her life the life of her son. "I saw parents struggle between fear and denial of infection. They shouldn't have to make that choice." The "world of cancer families," to use Page's term, is filled with love and loss. Page and Jack would bond with families and children, only to learn of their relapse or loss. Even today, Page gets choked up speaking about these families, who, like her, would have done anything to save their children. But she also remembers seeing mothers snuggling with their sick babies without wearing a mask. She remembers other parents changing dressings without gloves - or blowing on iodine to make it dry - or taking their vulnerable children to see a concert - and then sitting by their child's bedside as they fought off yet another infection. On the other hand, she saw parents steaming their hotel room carpets in their attempts to clean (not a good idea - it's better to lay a clean sheet over the carpet to avoid activating mold spores or aerating bacteria) or giving homeopathic medicines on the side that might not be sterile or regulated. She was able to find a balance, but her lasting thought is that these parents should not have had to make that decision, especially in the hospital, of whether to take on the job of controlling infection or leaving it up to chance. Parents like Page need interventions that help keep their kids safe. Since going through treatment with her son, Page has seen some improvements in this area: She used to have to request an isolation room in the ER for her son, and now this is standard procedure for oncology patients. The clinics she has gone to appear cleaner and there seems to be more attention given to isolating patients and training their caregivers. There are many more things she would like to see changed, however, including the use of preventive biocidal surfaces in all these oncology patient areas - over bed tables, IV pole grips, bathroom appliances, kitchenette counters - all those surfaces that were every day parts of Jack's life. "Surface is everything," she says, "Every person and every thing that touched my son's body." "Basking in the glory of normal." Cancer treatment requires sacrifice from the whole family. While Page was traveling and monitoring Jack's treatment and recovery, so much was missed: Siblings' 16th birthday parties, dance recitals, band competitions, driver's tests, graduations, college move-ins. However, today there is one thing that will not be missed: Jack. Two years after his first diagnosis, Jack's scans revealed no evidence of disease, and after another year of antibody treatment, Jack was released from the treatment protocol and has remained cancer free ever since. You can count on one hand the number of survivors from his protocol cohort - a group that started at around 300 patients. Page is the first to say that Jack's survival is a result of excellent care and great good fortune. She is grateful to live in a city with an excellent children's hospital, for the ability to enter a clinical trial and have the time and resources to make sure Jack could participate fully despite living hundreds of miles away from the cancer center, the support of a network of family and friends, and a strong spiritual center to sustain her. At many points along the way, Jack's health was out of her control. Thankfully, surgeries were successful, bone marrow was healthy, transplanted cells engrafted... but none of them could have been possible if Jack had succumbed to an infection. Page now serves as a support for other parents helping their children as she once did, and even speaks about her experiences to small groups. Her consistent message is not to be too trusting, don't ignore anything, don't assume anything, and ask questions all the time. She urges everyone, especially those in oncology, to remember "everything has been touched." Thank you for joining us in our first segment of a special patient population series. Future topics will explore how infection affects other unique patient populations, including those on dialysis and in rehabilitation facilities. Stay tuned!